Vietnam’s regulatory environment matured significantly since joining the WTO a decade ago. Foreign investors now benefit from a more predictable set of investment conditions that allow them a greater level of certainty when expanding operations or partnering with local companies. As the economy develops, Vietnamese regulators are now turning their attention from basic legislation covering investment and corporate establishment to more complex compliance areas, such as intercompany transactions. Transfer pricing guidelines regulate acceptable transactions between companies with similar ownership structures. 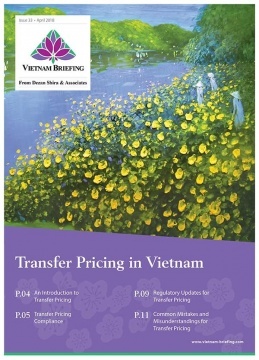 The Vietnamese government’s reform of transfer pricing regulations marks its most ambitious attempt to close the gap with more developed economies. Foreign investors should pay close attention to these regulations – any misunderstanding or failure to comply can result in fines or audits. Dezan Shira & Associates has a growing team of transfer pricing specialists in Vietnam, providing our clients with experience in navigating the nuances of their international operations, and helping them ensure compliance with local statutory obligations. For questions on optimal corporate structuring, compliance programs, or transfer pricing documentation, please contact us.